This month from MyPure I choose to try out a new edition to there website which is there Isle of Wolf candles. Before browsing their website I had never heard of this brand so I was quite excited to try them out. 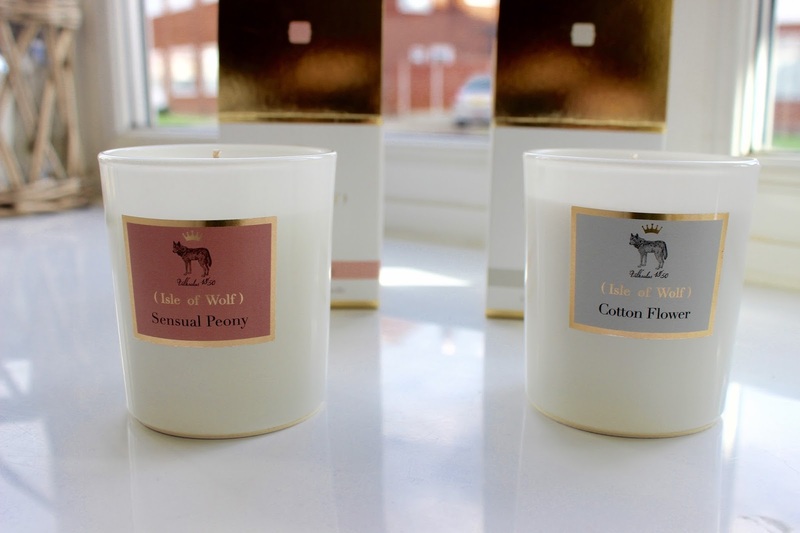 Isle of wolf have 9 different scents on MyPure to choose from, I decided to go for sensual peony and cotton flower as I prefer quite subtle scents rather than their other scents such as Bourbon Vanilla and Cinnamon spice. One of my favourite things about these candles is the packaging, its simple yet looks quite luxurious. The colour of the glass depends on the scent that you choose as some scents are in black votives. The Sensual Peony smells AMAZING its subtle yet you can still smell it which strongly when burning. It's quite a fresh scent without being too floral. The cotton flower scent is quite strong, stronger than what I thought it would be its definitely more floral than fresh scented. It contains notes of Bergamot, crisp leaves. Both candles have a 40 hour burning time and are £15 each which I think is quite reasonable. I would definitely recommend trying these candles out.